Have you ever seen those keychains where the keys are kept on the end of a long thin spring loaded chain attached to a housing that clips on your belt? When you are finished with the keys the chain springs back to the housing. The closer works the same way. There is a housing that mounts on the slider, and a long spring loaded string which gets attached to the door frame. When you open the screen door, the string pulls out. As soon as you let go, the spring pulls on the string and closes it. One thing to watch out for is that it wont work properly if your slider is hard to open. If you have a problem with rollers or a damaged frame, get it fixed first before installing a closer. The slider needs to glide open and closed easily for the closer to work properly. Screen closers come in a couple of different types. The most common are small plastic housing's that mount on the top. They have a string which pulls out of the housing and attaches to the door jamb. Other types have a housing which resembles a long thin plastic tube. The tube still gets mounted to the slider. These also have a string which pulls out and attaches to the door jamb. Both types use spring pressure to close the door. Before purchasing a screen door closer, make sure your screen door slides easily. The closer wont work with a door that is hard to open. If the door wont slide get the rollers fixed. 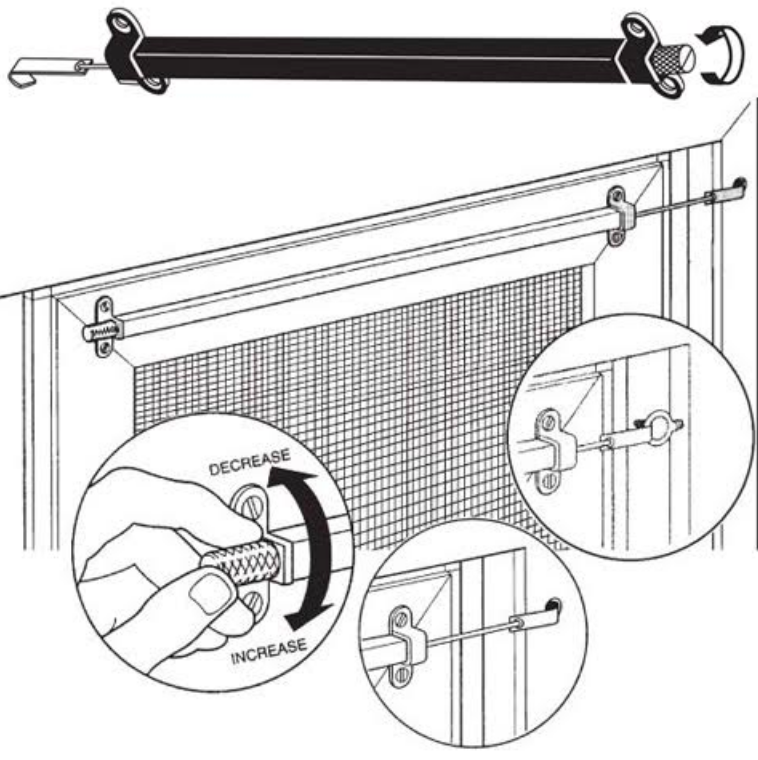 The closer pictured installs on the bottom (or the top) of a sliding screen door. On the side furthest away from the lock. Here are some closers available for sale on eBay. Note that there are a number of listings for storm door closers as well. These are meant for aluminum storms with hinges. Check for the types for sliding doors to make sure you find the right kind. Be sure to carefully check the feedback of any sellers before doing business with them.